While we're on a pedal trip, I'd like to add my own Dallas Arbiter pedal into the mix. 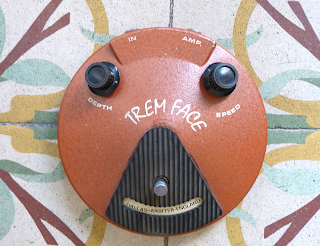 Mine is the Trem Face, which I bought at a car boot sale in the early 90's. For a long time, it was pretty obscure and became almost mythical until someone found a couple of boxes of about 40 NOS examples in a warehouse and put them on the market. It's estimated there were about 100-200 made altogether, so that still makes it fairly rare. I've seen these go for a thousand dollars a few years ago to less than three hundred a year or so back on Ebay but then there was someone asking $1795 (plus shipping) in 2010 on The Gear Page. The sound is quite nice and has a wide range and like many old pedals, the quality of the sound depends to some extent on the freshness of the battery. As the battery runs down it does start to break up a bit. Having said that, the battery does last a pretty long time. One of those sites, Geofex, has diagrams and some interesting thoughts on the construction of improved versions. On a side note, mine stopped working a while after I bought it so I took into the old Vox shop in Charing Cross Road (Macari's) and asked them to repair it. I had an old Colorsound pedal (which also didn't work) and I offered that in a straight exchange for fixing the Trem Face. When I pulled it out of my bag, the shop guy called the other guys over. They had never seen one before and as they were the ones who'd re-issued the Colorsound range, they ought to know something about them. Anyway, they agreed and I got it fixed. It has always been in the back of my mind just what that pedal was but I never saw it re-issued so it probably was just an experiment that never caught on and was dropped. The only thing I can remember about it now was that it was brown, more modern looking that the other pedals in the range and had an "IC circuit". Hmmm. David in Barcelona - inexplicably absent for the past few months but, hopefully with more time now.